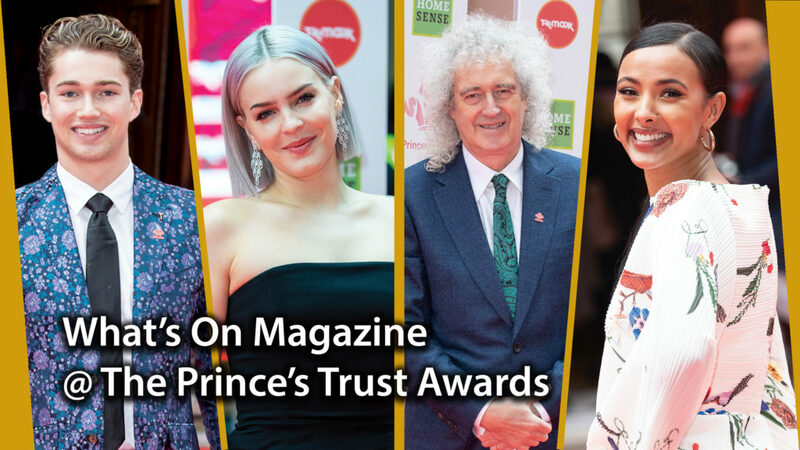 What’s On Magazine April 2019 edition features our pictures from the Prince’s Trust Awards. Phillip Schofield and Fearne Cotton hosted the annual Awards, attended by Chiwetel Ejiofor, Dr Brian May, Maya Jama and Danny Dyer. There were also special video appearances from long-standing Prince’s Trust Ambassadors Ant & Dec, Gareth Southgate and Joanna Lumley. His Royal Highness The Prince of Wales, founder and President of The Prince’s Trust, attended The Prince’s Trust and TK Maxx & Homesense Awards national final, held at The Palladium in London. The awards recognise young people who have succeeded against the odds, improved their chances in life and had a positive impact on their local community. A series of regional events took place in October 2018 and culminated in this red-carpet ceremony hosted by Phillip Schofield and Fearne Cotton in the national final at the Palladium. Nine awards were given out by celebrity presenters, including Prince’s Trust Celebrity Ambassadors. Among them were Chiwetel Ejiofor, Dr Brian May, Maya Jama, Danny Dyer, Kate Garraway, Luke Evans, Nicola Adams, Tinie Tempah, Gemma Atkinson and Tom Walker. Dylan England, 26 from Surrey was the winner of the Homesense Young Achiever of the Year Award and was presented his award by Chiwetel Ejiofor. Years of systemic abuse left Dylan from Surrey, battling with depression and feeling at rock bottom. When he saw the same cycle of abuse starting over with other children, he knew he had to do something, so he reported it to the police and gave evidence in court. The experience took its toll on Dylan and he attempted to take his own life a number of times. Dylan joined The Trust’s Team programme at Carshalton College in 2017 with the hope of turning his life around when many others had given up on him. Dylan feels like his life has now begun and is using his role as a Young Ambassador to inspire and empower others. He is also now working as an Assistant Team Leader on the Team programme to help other young people build the confidence and skills they need to turn their lives around. There were a series of special moments for the young winners of the awards, including the winner of the HSBC UK Breakthrough Award, Kieran Egan, being surprised by one of his idols, England Manager and Prince’s Trust Ambassador Gareth Southgate. Youth charity The Prince’s Trust gives young people the skills and confidence to live, learn and earn. Three in four young people helped by The Prince’s Trust move into work, training or education. TK Maxx and Homesense have been a partner of The Prince’s Trust since 2013 and are one of The Trust’s largest delivery partners of the Get into Retail programme. This is a two to six week course that develops young people’s skills in the retail sector and supports them into positive outcomes in retail. Since the partnership began, over 70% of young people who have taken the course went on to full time employment at TK Maxx or Homesense. TK Maxx and Homesense are proud to have helped over 1000 young people through the Get into Retail programme. Homesense supports The Prince’s Trust’s work with vulnerable young people through the Achieve programme, which helps young people aged 13-19 to engage and succeed in education. Achieve helps vulnerable young people to overcome the barriers holding them back and provides them with the support and skills they need to get their lives back on track. With the support of Homesense associates and customers, vital funds will be raised to help more than 1,500 young people in local communities across the UK to develop the skills and confidence needed to engage and succeed in education, through relevant, engaging and informal learning.